MULTIPLE CHOICE: 100pcs barrel Swivel with Interlock Snap with box. Size of #12, #10, #7, #5, #3 and 20pcs of each size. Test from 26lb to 55lb. Various of sizes are available for different fishing application. CORROSION RESISTANCE: swivel made of brass body with stainless steel welding ring. Snap made of stainless steel with black nickel coated. Excellent corrosion resistance, abrasion resistance and shock resistance. 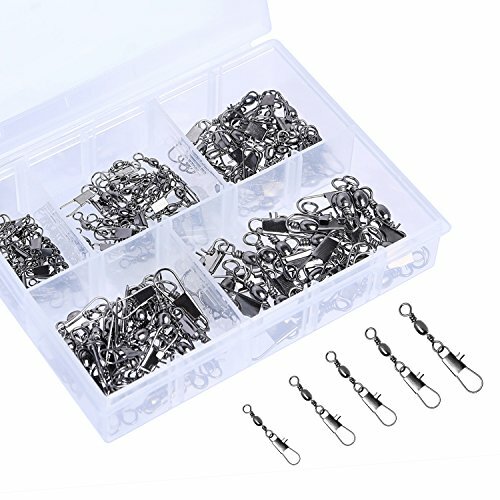 RIGGED IN SECONDS: the connector snap can quickly connect a variety of fishing hooks, explosion hooks,easy to use for all types of fishing, string hook line group. SMOOTH: 360 rotating freely without limit, do not hurt the fishing line and anti-winding. WIDE RANGE OF APPLICATION:suitable for high speed trolling, jigging, offshore fishing. widely used in saltwater and freshwater. Small size would perform well in freshwater.